Metta Charlotte Kahl, 98, formerly of East Walnut Street, Ashland passed away February 25, 2008 at Brethren Care Nursing Home. She was born May 2, 1909 near Shenandoah in Richland County, the daughter of Farlan and Edna (Seymour) Phifer. She lived in Ashland since 1910, graduated from Ashland High School, and worked as a reporter for the Times Gazette for 27 Months. While attending Ashland College she did publicity work four years, and graduated as salutatorian of her class in 1933. She married Burton C. Kahl August 6, 1933. She was active in PTA as a secretary of Arthur Street and Junior High Schools and was secretary of the Air Force Mother's Club. 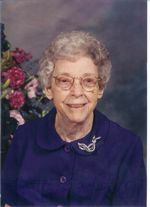 She joined First Christian Church in 1919, sang in the choir for 39 years, taught the beginners Sunday School class, sponsored a mission group for High School girls, was president of Christian Endeavor, and was active in the Southeast Circle of Women's Organized Work, Christian church board, and was a member of the Fellowship Sunday School class. She is survived by one daughter and son in-law, Emily Jo (Larry) De Priest of Ashland; two sons and daughter in-law, William Arthur (Susan) Kahl of Campobella, South Carolina; and David Allan Kahl of Columbus. Also surviving are seven grandchildren, Phillip Howard (Ann) De Priest of Findlay, Vicki Ann (Tom) Robinson of Jeromesville, Paula Stiefel of Baton Rouge, Louisana, Douglas Kahl of Campobella, South Carolina, Lynn (Mike) Johnson of Columbus, Tanya (Eric) Kline of Mogadore, and Karen (William) Clark of Detroit, Michigan. There are also ten surviving great- grandchildren. Preceding her in death was her husband Burton Kahl, in January 2000, her parents, two daughters in-law, and an infant grandchild. Funeral services will be held at Heyl Funeral Home on Thursday February 28, 2008 at 11:00 a.m. with Chaplain Jerry Gess officiating, visitation will be one hour prior to the service. Burial will follow at Ashland Cemetery. Memorial contributions may be made to the First Christian Church, 405 Cottage Street, Ashland, Ohio 44805.